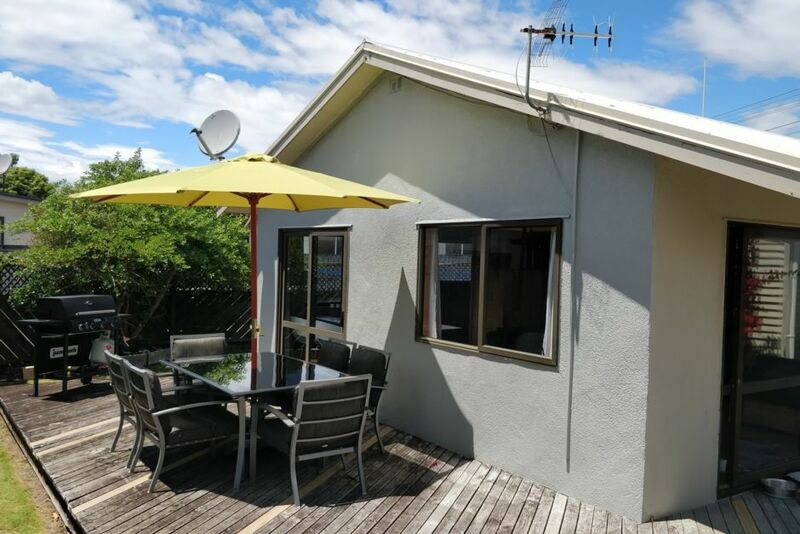 Holiday house only minutes walk to Papamoa Beach which is renowned for its stunning white sand and surf. This is the ideal holiday getaway families and couples alike. If you want a great location this is the place. The section is fully fenced for added peace of mind if you choose to bring your furry friend. The Papamoa Plaza and Fashion Island shopping centres are 500m (5min walk) away or a 1min drive where you can enjoy a relaxing coffee or a meal at one of the many restaurants and bars. The renowned Mount Maunganui beach, walking tracks and hot pools are an easy 17 minute drive away. Please give details when inquiring as to whether you are a family group or a group of friends and what the ages of your group are, if you do want to bring your pet please let us know the breed and age. 1. Quiet bach, please respect neighbors. Sleeps 6 -adults/children. Price is for up to 6 guests. 2. Duvets/blankets/pillows/sheets/towels supplied for the 4 beds, please bring your beach towels 3. Parking- 1 off street park and; plenty of on street parking. 4. Dogs must have prior approval, . 5. Additional cleaning/linen fee of $85 applies to all bookings, Bach must still be left tidy. 6. Shorter stays may be available in high season. Enjoy! Great location and comfortable property. The property was well equipped and a comfortable base for our family. Great location! This was the perfect base for our visit - it would be excellent too for a full holiday. The location is excellent - down a beach access path and across the road, and there's the beach. The three separate bedrooms give privacy and good comfortable beds. There's a really good shower, an easy to use and very well-equipped kitchen, comfortable lounge with plenty of entertainment options, etc. The extras were impressive - even a choice of marmite or vegemite sachets! And it's close to shops and other amenities. Plenty of local information and clear instructions about how things work from Scott - it was so easy. Thoroughly recommended. Perfect batch. Great location. Very clean. All amenities you need. Perfect for our dog too and lots of toys for our boy and family to enjoy. We will be back! Fantastic home. Clean and comfortable (great beds which is so important). Love that we can walk to the beach. Can't beat this location. This is an awesome property with a fabulous location (two minutes to the beach)! The house was clean on arrival with everything you could want and more already there. Scott was so helpful throughout our trip. We will be back!